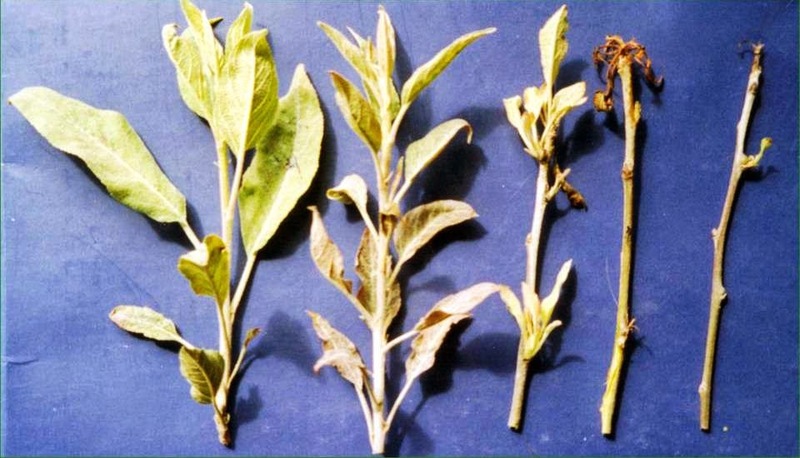 This is in continution to my yesterdays post on Diseases of Apple: Powdery Mildew Disease Cycle. Today I am going to give you few tips how to manage this disease that causes various economic losses to the crop including the quality detrioration of the fruit. Before talking on the Powdery Mildew disease management, I would like you to remind one of my post on Principles of disease management, where we have talked about four major principles. Here we shall be taking all the principles one by one and see how we can use these principles to manage the disease. 1. Phytosanitation: The twigs that are showing infections should be removed during the maintenance pruning. The cleanliness reduces the primary inoculum of the disease causing agents. This simple principle should be followed as soon as the first symptom appears on the farm. The precuation that should taken care of while removing the infected twings during spring season you should remove these twigs before the sun rise when dew is on that will not allow the conidia of the fungus to germinate (leaf wetness plays an important role). This is the best way to manage the diseases on small farms and helps in reducing the costs. 2. Cultural Practices: Alter the environment in which disease is appearing by using some cultural operations like removing some of diseased portions and altering the drainage of the soil or using some inter-cropping pattern's or using some other crop as barrier crop or trap crop etc. Since powdery mildew is dry weather disease, this can be managed by altering the disease favouring envrionment the disease can be managed easily. If we go through the literature, dry weather doesn't mean that low humidity but it means no leaf wetness. Powdery mildew appears at about 25oC and RH is above 80% but no leaf wetness. This condition suggests that if we have provisioned the air circulation in the orchard that will not only reduce the relative humidity but also lower down the temperature, thus becomes unfavourable for the disease development. This also removes the primary inoculum as well as modifies the environment for disease proliferation again without enhancing the cost to a greater level. 3. Biological Control: Introduction of biological control agents directly on the phylloplane (leaf area) helps the plant in fighting with plant pathogen and help the plant to grow healthy with a little cost. Ampelomyces spp; Pseudozyma spp; Tilletiopsis spp and Verticillium lecanii are few examples of Biological control agents that plays an important role in nipping down the powdery mildew fungus. 4. Chemical Control: Agrochemicals should be the last priority to manage the disease and that too after the proper diagnosis. As the application of a wrong chemical will not only worsen the situation but also pollute the environment. In turn increase the cost without preventing the damage caused by the insect-pests or disease. Annual spray schedule devised for apple scab control also includes fungicides specific to powdery mildew. However, powdery mildew is economically important disease to affect pink to petal fall stages. At this stages specific group of fungicides like EBI (Score, Topas, Contaf) and benzimidazoles (Benlate, Carbendazim) are effective. In coming posts I shall be talking about collar rot of apple.